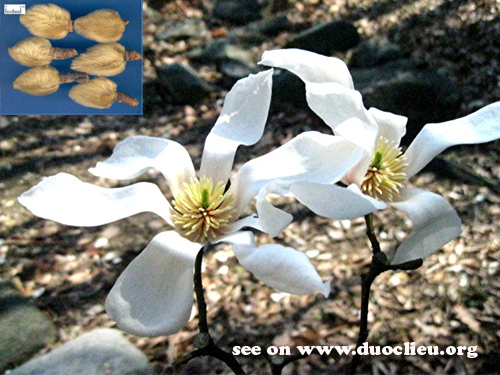 Part Used & Method for Pharmaceutical Preparation: The flowerbuds are gathered in the early spring and dried in the sun. Functions: 1. To expel wind and cold; 2. To open the nasal cavity. 1. Rhinorrhea manifested as nasal obstruction, headache, runny nose and loss of smell. For the cold-type of rhinorrhea followed by white, dilute and profuse nasal discharge, Magnolia flower (Xinyi) is used with Asarum herb (Xixin), Dahurian angelica root (Baizhi) and Xanthium fruit (Cang'erzi). For the heat-type of rhinorrhea with yellow, thick and scanty nasal discharge, Magnolia flower (Xinyi) is used with Mentha (Bohe) and Scutellaria root (Huangqin). 2. For stuffy nose and rhinorrhea due to Wind Cold, it is used with Herba Asari ( Xi Xin), Radix Angelicae Dahuricae (Bai Zhi) or Menthae Arvensis (Bo He), and Radix Scutellariae (Huang Qin). Dosage: 3-10 g, decocted in water for internal use. Appropriate quantity for external use. The villi of Flos Magnoliae are irritating to the throat. It is suggested that the herb be wrapped in gauze while decocting. Overdosing causes redness of eyes and dizziness.